Summary. The article is devoted to the study of conceptual approaches to the formation of the stages of development of newly created enterprises. Generalized scientific approaches to the definition of the essence of the startup and all the necessary stages of its cycle of existence. The most important features that need to be taken into account when designing such companies are identified. It is substantiated that the startup is a broad and multifaceted concept that does not have clearly defined themes or areas of activity, may have a very varied interpretation through a number of distinctive features. The main components of the creation system of startups, which are originally presented as the minimum set of necessary components, are outlined, and during all stages of the life cycle, new quantitative and qualitative properties are acquired in order to achieve the required level of performance. The necessity of continuous improvement of the theoretical positions, methodical approaches, mechanisms and tools of forming the system of creation and support of the enterprise through constant development, which will promote improvement of its financial and economic condition and market prosperity, is confirmed. It is determined that the system of creation and development of an enterprise should be based on certain stages: the formation of an idea / concept; financial planning; marketing analysis and research; marketing strategy; sales organization and sales channels; promotion; pricing; release of products and description of their properties; advertising and media planning; PR, GR, CSR; personal sales; sales promotion. The generalization of approaches to the system of creation and development of the start-up company is carried out. Key words: startup, newly created company, financial planning, Waterfall, project triangle, startup marketing, innovation. Анотація. Стаття присвячена дослідженню концептуальних підходів до формування етапів розвитку новостворених підприємств. Узагальнені наукові підходи до визначення сутності стартапу та всіх необхідних ступенів його циклу існування. Виявлені найголовніші риси, які необхідно брати до уваги при проектуванні таких компаній. Обґрунтовано, що стартап є широким та багатоаспектним поняттям, яке не має чітко окресленої тематики або сфери діяльності, може мати дуже різноманітне тлумачення через ряд відмінних рис. Окреслені основні складові системи творення стартапів, які спочатку представлені як мінімальний набір необхідних компонентів, а впродовж усіх стадій життєвого циклу набувають нових кількісних і якісних властивостей задля досягнення необхідного рівня результативності. Підтверджено необхідність постійного удосконалення теоретичних положень, методичних підходів, механізмів та інструментів формування системи створення та підтримки підприємства через постійний розвиток, що сприятиме покращенню його фінансово-економічного стану та ринкового процвітання. Визначено, що система створення та розвитку підприємства повинна ґрунтуватись на певних етапах: формування ідеї/концепції; фінансове планування; маркетинговий аналіз та дослідження; маркетингова стратегія; організація продажу та каналів збуту; просування; ціноутворення; випуск продуктів та опис їх властивостей; реклама та медіапланування; PR, GR, CSR; персональні продажі; стимулювання збуту. Здійснено узагальнення підходів до системи створення та розвитку підприємства-стартапу. Ключові слова: стартап, новостворене підприємство, фінансове планування,Waterfall, трикутник проекту, маркетинг стартапів, інновації. Аннотация. Статья посвящена исследованию концептуальных подходов к формированию этапов развития новосозданных предприятий. Обобщены научные подходы к определению сущности стартапа и все необходимые степени его цикла существования. Выявлены главные черты, которые необходимо учитывать при проектировании таких компаний. Обосновано, что стартап является широким и многоаспектным понятием, которое не имеет четко очерченной тематики или сферы деятельности, может иметь очень разнообразное толкование из-за ряда отличительных особенностей. Очерчены основные составляющие системы создания стартапов, которые сначала представлены как минимальный набор необходимых компонентов, а на протяжении всех стадий жизненного цикла приобретают новые количественных и качественных свойств для достижения требуемого уровня результативности. Подтверждена необходимость постоянного совершенствования теоретических положений, методических подходов, механизмов и инструментов формирования системы создания и поддержания предприятия через постоянное развитие, что будет способствовать улучшению его финансового состояния и рыночного процветания. Определено, что система создания и развития предприятия должна основываться на определенных этапах: формирование идеи / концепции; финансовое планирование; маркетинговый анализ и исследования; маркетинговая стратегия; организация продаж и каналов сбыта; продвижения; ценообразования; выпуск продуктов и описание их свойств; реклама и медиапланирование; PR, GR, CSR; персональные продажи; стимулирование сбыта. Осуществлено обобщение подходов к системе создания и развития предприятия-стартапа. Ключевые слова: стартап, новосозданное предприятие, финансовое планирование, Waterfall, треугольник проекта, маркетинг стартапов, инновации. Statement of the problem. The development of startups is widespread abroad. Such projects bring significant profits not only to start-ups and investors, they also raise the level of the economy in their countries. In Ukraine, the startup movement is only gaining momentum. 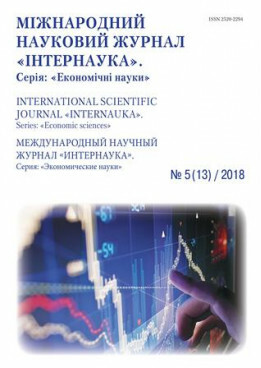 The development of startup businesses in the Ukrainian economy in current conditions preclude the presence of problems related methodological, institutional, organizational, informational, marketing and investment issues. One of the topical methodological problems is the lack of a unified approach in determining the main characteristics of startups. In the business practices of different countries among startups include companies with different age, number of employees, the volume of own and borrowed funds, the amount of income. At the same time, the approaches share a common idea of ​​the presence of a startup company Innovative nature of the activities fold increase in sales and profits over a relatively short period of time since the launch of the project. Developing a unified system of indicators for classification of enterprises to start-ups becomes relevant theoretical and practical task that requires scientific study. Another important factor is effective marketing realized startup projects using innovative technologies of online promotion, opportunities for investments (public-private through development institutions, private from business angels, venture capital funds, collective investment based crowdfunding) rendered specialized Internet sites, as well as crowfing sites with the creation of communities of such sites in social networks. Integrated solutions to these problems contribute to the successful operation of innovative startups and strategic goal implementation of innovative models to ensure a competitive, sustainable and secure economic development of Ukraine. Analysis of recent research and publications. Problems of organization and development of innovative enterprises and start-ups were investigated by such scholars as A.Yu. Kovaleva, N.V. Ivashova, O.V. Pomorova, V.S. Pikul, D.Yu. Zbanatsky, OA Matsevich, MR Barabash, O.V. Marchenko, J.A. Govorukha, L.G. Smolyar, T.E. Belyalov and others. Researchers interpret startups in different ways, offer a large number of options for dividing the company's life cycle into several stages. At present, the scientific society has not reached the final conclusion on the interpretation of startups and the definition of the components of the system for their creation and development. The purpose of the article is the theoretical substantiation of the essence of startups and coverage of the introduction of a system of stages of their creation and development. The main material. Startup is a newly created company, which arises as a result of the demand for goods or services that most often have certain innovations, innovation in a particular field. The purpose of the launch is rapid growth and development as a result of the offer that relates to a specific segment of the market. There are no fixed options for which type of company can be considered as a startup, but the term is most often used by high-tech companies that create products that use technology to offer something new or to fulfill a task that exists in a new way. Examples of startups that are now corporations are: Dropbox, SpaceX, Snapchat, Xiaomi, Uber, Airbnb, Dmarket and others. Financial planning is necessary to formulate a clear goal for a certain period of time, demonstrate its reality and determine the criteria for its achievement. Also, financial planning allows you to save resources and time, as the need to determine the goal after the previous one disappears. Another significant advantage of financial planning is the clear idea of investors about the prospects, plans and relevance of the startup to investment policy . multivariateness – prediction of various variants of business activity, determination of advantages and disadvantages of each of them . the cost proportions resulting from the allocation of financial resources. It is possible to distinguish certain stages of preparation, implementation and development of the newly created enterprise (Pic. 1). First of all, you need to work out a business idea. Business ideas are an algorithm of actions, a plan, a set of measures aimed at creating a new company (private enterprise) in any of the directions of activity for a stable profit . When working out a business idea, we can not forget about the innovation of products or services that will continue to be provided / sold by this company. Innovation is an integral part of the company's success, especially with the creation of a new company, which needs to attract new customers, partners and investments. After these points, you need to consider all aspects that help make a business project profitable. To do this, you must adhere to certain points: a dedicated goal, how to achieve it, terms, outlined resources, budget, and a specific customer reach . A very important aspect is the observance of uniformity in the "triangle of the project" (Pic. 2). Each project represents a triangle with balanced time, money and coverage - changing one of the factors without touching at least one of the others is impossible. The task of the project manager is to ensure that the triangle does not collapse. Consider for example the life cycle of a business project by the classic model Waterfall . Waterfall is one type of methodology that stacked all stages of a project step by step. The cascade system principle is in sequence. The transition to each phase occurs only after the end of the previous one. Consider a more detailed diagram of the stages of enterprise development from the emergence of ideas to the final implementation and support products or services (Pic. 3). The scheme was developed through analysis of marketing research, financial planning, PR-company and forms the basis of the organizational structure of future start-ups. Conditionally divide the formation of the company into 12 stages. The first stage is basic. At this stage, an idea of the product is formed, a brief description of the initial hypotheses about business is made. It's worth starting with the goal: what, why and, most importantly, for whom you want to create. It is advisable to support this information in figures. It is important to investigate in detail the target audience and draw a portrait of the prospective client based on the information received [8, p. 124]. The second stage, which is based on financial planning, includes planning of all incomes and directions of spending money to ensure the development of the organization. The main objectives of this phase are to establish a consistency between the availability of financial resources of the organization and the need for them, the choice of effective sources of financial resources formation and favorable options for their use. In the process of financial planning, an optimal proportion is established between financial and material resources . The third stage, marketing market analysis is an important stage in the work of the marketing manager. High-quality market analysis allows you to quickly find free market niches, choose the most attractive target market, better understand the potential consumer of the company's products. The fourth stage, the marketing strategy of the enterprise allows you to understand how to plan and implement a variety of activities in the company, aimed at the implementation of plans and tasks. It's worth remembering: marketing strategy is one part of the overall strategic plan of the company. The marketing strategy is related to the issues aimed at increasing sales and income of enterprises. The fifth stage is closely linked to sales and sales channels. Under the channels of sales of goods or products implies a chain of companies or individuals involved in their movement from manufacturer to consumer. Channels are characterized by the number of links involved in the process, as well as how the functions are distributed among them . The sixth stage is promotion - a set of marketing events whose goals are to increase the proportion of goods, services, company or brand they occupy on the market; withdrawal of goods on the market; increase their recognition; attracting new customers. The seventh stage is the price setting for a product or service. There are two main pricing systems: market pricing based on the interaction of supply and demand and centralized state pricing based on the pricing by state authorities. In a market economy, the process of choosing the final price is made depending on the cost of production, the prices of competitors, the ratio of demand and supply, and other factors. The eighth stage is the release of a product and outlines its functions and properties. The ninth stage is an advertising that is a form of communication that translates the product into the language of the users' needs, a public notice of the product, its properties and benefits. The tenth stage includes PR, GR and CSR. PR - communication company, aimed at forming a harmonious relationship with customers, establishing and maintaining effective relationships with useful audiences, studying the public response to products. GR - is the establishment of contacts with local and state authorities. CSR is a responsibility taken by an enterprise for its product and its properties . The eleventh stage is personal sales. The basis of this process is direct contact without intermediaries with potential clients and their feedback about their needs, complaints, interest in these products. The twelfth stage is the stimulation of sales. During this stage, customer purchasing opportunities are stimulated by various factors, as well as the increase of the initial product price for a certain period of time. Conclusion. On the basis of the review of modern scientific researches it is possible to distinguish formation and development of the enterprise in separate stages. In this article, using data from research and other sources of information, the division of processes of organization of the newly created enterprise into 12 stages, which are obligatory elements of the cycle of activity, on which the startups should be based, was performed. Consequently, during the construction of a modern system for the creation of a startup, it is necessary to pass the stages: the formation of an idea / concept; financial planning; marketing analysis and research; marketing strategy; sales organization and sales channels; promotion; pricing; release of products and description of their properties; advertising and media planning; PR, GR, CSR; personal sales; sales promotion. When constructing a modern system of financial and economic security, an enterprise must also take into account factors that may have a destabilizing effect on the level of financial and economic security of the enterprise. Consequently, in the present-day conditions startups need to adhere to these stages in order to create, develop and successfully operate their enterprise. Blank S. Startup. Handbook of the founder / S. Blank, B. Dorf. – M. : Alpina, 2013. – 616 p.
Biluk M.D., Bielialov T.E. Financial planning at enterprise/ M.D.Biluk, T.E.Bielialov –K. :LTD «PanTot», 2015 – 436 р.
Mandrytsa O.V. Financial model of investment in the equity of an innovative start-up / O.V. Mandrytsa, Vestnik SevvKavGTI. 2012. №.13. p.173-177. Startup for quick testing of ideas and business model selection. M .: Alpine Publishers, 2014. – 256 p.
Бланк С., Дорф Б. «Стартап. Настольная книга основателя» / С. Бланк, Б. Дорф, М.: Альпина Паблишер, 2014. – 616 с.
Білик М.Д., Бєлялов Т.Е. «Фінансове планування на підприємстві»: навчальний посібник/ М.Д. Білик, Т.Е. Бєлялов – К.:ТОВ «ПанТот», 2015 - 436 с.
Мандрица О.В. Финансовая модель вложений в собственный капитал инновационного стартапа / О.В. Мандрица, Вестник СевКавГТИ. 2012. №.13. С.173-177. Startup для быстрого тестирования идей и выбора бизнес-модели. М.: Альпина Паблишер, 2014. - 256 с.